Fuoristrada raced through the park with the balloon in hot pursuit. 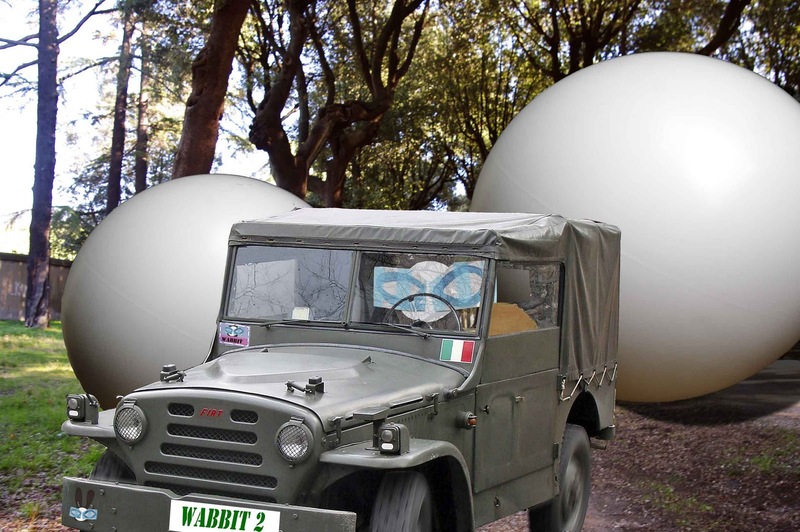 "More incoming at 2 o'clock," shouted the Wabbit and he gunned the throttle. "There's can't be more than one!" said Fuoristrada, "I don't believe it!" "What happened to the sharp twigs?" yelled the Wabbit. "Park keepers," moaned Fuoristrada, "they've been sweeping." The Wabbit wrenched the steering wheel and muttered "Jobsworths" through gritted teeth. "Head for Gianicolo Hill," shouted the Wabbit and I'll call this in." "Is that wise?" asked Fuoristrada. "Bite the bullet, we're going through the city and we'll lose them," said the Wabbit and he looked out the window and swerved right. "Mo' te gonfio!" he shouted at the nearest balloon as he passed. The balloon bounced high in the air but it fell back a little. "They didn't like that," shouted the Wabbit. There was an awful moaning sound and the balloon span round and round. "Do it again," suggested Fuoristrada. The Wabbit looked out again and yelled "Toglietevi dai coglioni!" "That's very rude!" said Fuoristrada" There was a howl of protest from the other balloon and it whirled like a top. "I can get ruder" said the Wabbit. "Non mi rompete le palle!" he shouted. The two balloons bounced together and shot high in the air screaming with anger. "That's done it"" said Fuoristrada.